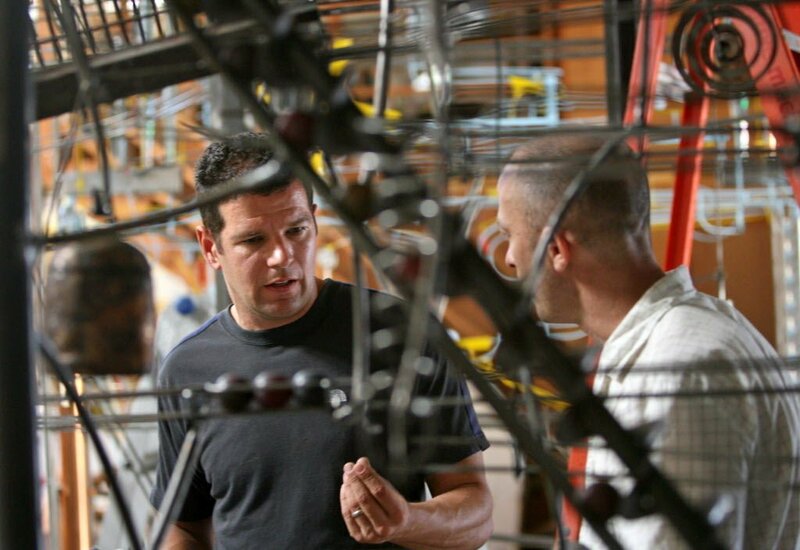 Joe O'Connell, owner of Creative Machines, and Ezequiel Leoni are seen through the metal framework of multiple kinetic ball machines designed by artist George Rhoads. 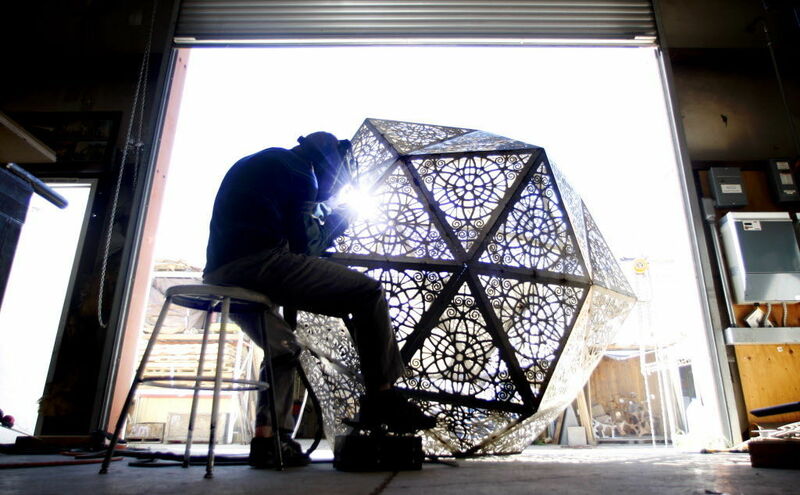 Design engineer Elliot Hart welds the stainless steel triangle panels together to make the urn for the 2012 All Souls Procession at Creative Machines in Tucson. Joe O’Connell’s solar-powered Desert O sculpture shines brightly along Alameda Street near the Tucson Museum of Art. O’Connell’s company’s public art and museum exhibits are displayed around the United States and even in other countries. “Wondrous” by Creative Machines is installed at Marana’s Wheeler Taft Abbett Sr. Library. A cyclist passes Creative Machines’ Bike Church sculpture in Barrio Anita on the southwest corner of North Granada Avenue and West Davis Street. Joe O’Connell works on the interactive “Public Drums” at Creative Machines, which has since outgrown its space. A Tucson company that makes public art and interactive museum exhibits is asking the city for a tax incentive to help with its expansion. This month, Creative Machines plans to move two miles east to a bigger, 65,000-sqaure-foot space at 4141 E. Irvington Road, east of South Alvernon Way, formerly Southwest Fiberglass. Tucsonans probably know their work. The company made the “Bike Church” on Granada Avenue, the light-up doughnut “Desert O” on Alameda Street, the walk-through “Cocoon” on Houghton Road and the interactive “Bubble Tubes” at Tucson Medical Center. Marana residents may know it, too. Creative Machines made “Wondrous,” the wall of words at the Wheeler Taft Abbett Sr. Library. Creative Machines has 29 employees — up from just two in 2001. Its jobs pay $35,000 to $72,0000 a year. The company applied for a waiver of the $10,000 city permit fee under the Global Economic Development District incentive program, which was meant to attract small factories to the airport area and interstate corridors. To qualify, a business must make a capital investment of at least $1.5 million. Creative Machines bought a bank-owned building for $1.56 million on Dec. 18 and plans to spend $850,000 to repair and improve it. Remediation work is underway, O’Connell said. Creative Machines also applied to use an estimated $6,500, which it would have paid in city construction sales taxes, on job training for its employees instead, including classes at Pima Community College. “It’s going to go back into helping us build a better business,” O’Connell said. The company is the first to apply for the incentive program since it was approved in 2011. The City Council will discuss the application at its Tuesday meeting. The next step is an economic analysis to be sure the city will benefit from the deal. The city will use the results to decide whether to approve the deal. Councilman Richard Fimbres said the project activates an empty building, plus it adds jobs for engineers, artists and fabricators. He met with the company leaders and was impressed with their internships and mentoring opportunities. “These are folks who do business all over the world and it’s really promising,” he said. “The whole idea is to get people wet,” says the creator of this sculpture and many more around Tucson. Tucson’s Sun Link streetcar isn’t scheduled to begin its rounds until the end of July. The Tucson-based maker of museum exhibits moves into the sprawling former Sundt Cos. complex.